What is it about fairy tales that so enchants us? As children they open our eyes to the possibility of magic and good and evil. They assist in the initial stretching of our imaginations and create in us a sense of awe and wonder. Which of us can look back on our childhood and not remember a feeling of glee when Rapunzel cures her lover's blindness with her tears? A sense of foreboding when Hansel and Gretel are invited inside the gingerbread house? I've found that my love of fairy tales has endured into my adulthood. I cannot shake my love of them, the imagination of their writers. I have a deep, residing respect for the creators of fairy tales. Who first imagined the concept of a mermaid? Who came up with the idea of fairy godmothers, glass slippers, poisoned combs and enchanted apples? I'm inspired by the idea of such boundless imaginations. And today, we re-imagine them. We stretch them and twist them and make them new again, so we can enjoy them over and over. Those past storytellers have given us an endless stepping stone to creating beautiful tales for years to come. I read just such a tale today. 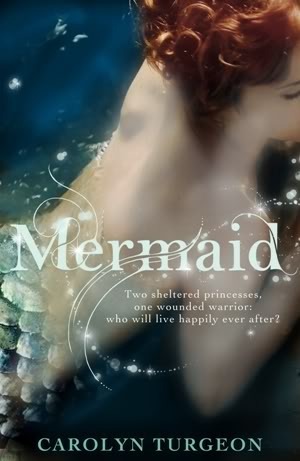 It's called Mermaid, and it's written by Carolyn Turgeon. There have been many who've taken a swing at the classic tale of the little mermaid, some good and some bad. This one was good. In an effort to keep from giving anything away, let me just tell you this: she took the idea, expanded on it and gave it more layers. It's lovely, creative and I had a hard time putting it down. I recommend that you all give it a try. What are your favourite re-imagined fairy tales? Please tell us all about them in the comments section below! There's nothing better than a good book, and I'm in the mood for fairy tales. Let's help each other out and pass on the word about similarly fantastic fairy tales. Robin McKinley's Beauty, Spindle's End, Deer Skin (and she has one about Robin Hood too ... can't remember the name of it though). Sherri S. Tepper's take on Beauty. Those would be my picks. I love Beauty by Robin McKinley! I also enjoy some of the spoofs or ones from a different point of view. I also loved Beauty and Deerskin by Robin McKinley! Great suggestions so far, keep 'em coming! Now I have a host of books to add to my To Read list! These sound great. Can't wait to dive in!